Definition 1. A traditional story, especially one concerning the early history of a people or explaining some natural or social phenomenon, and typically involving supernatural beings or events. Definition 2. A widely held but false belief or idea. These are the definitions given by the Oxford English dictionary for the word myth. Jackie is a film about the aftermath of the last Presidential assassination in the United States of America. Television was starting to reside in most homes in America and President Kennedy in life and in death commanded it. The ideas that grew out of these images have left an indelible mark on the American psyche and the world. My Australian baby boomer parents remember November 22nd, 1963 almost as keenly as anything else from their lifetime, my mother remembers it as the first time you could see on television grieving in the streets openly in America. The fact that no easy answers have been found as to why and by whom have impacted the country ever since. Their President was taken from them and they never saw justice prevail. Now imagine what that does to a wife. Jackie the movie is an ambitious undertaking seeking to retell a story we’ve already learnt several times over and render something new. When they say it is told by the perspective of Mrs Kennedy, they are not kidding she is in every scene and I’d be interested to know the percentage of shots. So much of the film are these lingering tracking shots following her around the White House playing records, fixing drinks and trying on clothes and jewellery. What is she thinking? How grief stricken is she? What is most important to her now? The only two adults she actually converses with at any great length are Robert Kennedy (Peter Sarsgaard) and a priest (the late great John Hurt in his final performance). Bobby mostly expresses his own thoughts to her so it falls to the priest to allow her to lay bare any inner turmoil or peace. Director Pablo Larrain and writer Noah Oppenheim are more content to have each individual member of the audience piece together their own thoughts from watching small gestures from the first lady in these long contemplative tracking shots around the White House. These kind of techniques are hard to pull off and require great discipline from the actress Portman and the production crew but this style of filmmaking can sometimes be too indulgent. The film is stronger when something on screen is happening but a film that deals with the nuance and contradiction of how we all deal with grief does well to show mundane actions being carried out by an individual cracking at the seams. Slowly we come to see the house she roams through she is being evicted from, the superficial items she tries on reflect wealth she may no longer have and carry memories of days when her husband was alive and with her, the alcohol is to self-medicate and the lack of action reflects an essential truth-she is alone. Staff is nearby but they won’t be soon and well-wishers offer sympathy but no real answers. Jackie is the widow of a powerful man in a patriarchal age but what power does she yield herself? Imagery and symbolism she decides and while women were told what to do an awful lot back in 1963 there were some things they couldn’t be refused either. The film is not told in a linear fashion but concentrates on three time periods moving between all of them seamlessly setting up the actions of subsequent moments. One takes place during the filming of a special about the renovations the First Lady did to the White House (pivotal for showing the public persona of the First Lady and where she was schooled on it by Nancy Tuckerman played by Greta Gerwig), another begins that fateful day in Dallas and ends with the funeral procession through Washington, and the third takes place in Hyannis Port, Massachusetts where Jackie was interviewed by Theodore H. White for Life magazine less than a fortnight after becoming a widow. White played by Billy Crudup like any good journalist tries to capture a moment in time and gain insight into the personality of his interview subject. Mrs Kennedy like any famous person tries to sell a story that she wants told. Both know what the other wants but Kennedy is holding all the cards and it is here that Camelot was born. Shot beautifully by cinematographer Stephane Fontaine and using a haunting and dreamlike score by Mica Levi the film at times has the aesthetics of mourning. One shot haunts of a cold gloomy highway with the Dallas motorcade driving at speed with a secret service agent riding on the booth towards the hospital. The camera catches up and flies above the car but stops at the point where Mrs Kennedy’s own head blocks her dead husband’s from the camera’s view. Arlington cemetery is first shown in fog and the only time the sun really shines is in Dallas before the President is shot, not after. A late sunset blooms during a rooftop conversation between Bobby and Jackie about their options. As the sun sets Jackie steels her resolve, Bobby the hope for the future is present and the reality that President Johnson must move into the White House comes forward as the sun sets only to rise again tomorrow. Natalie Portman gives a tour-de-force performance here, never really looking like Jacqueline Bouvier Kennedy Onassis, at times not even sounding like either of her voices (the public and the private), she does however nail the depiction of a woman going through grief and the dichotomy of Mrs Kennedy’s priorities for family and legacy. Often in rooms surrounded by powerful men she stands her ground and gets her way with a backbone of steel people mistook at their own misfortune. Grief stricken at the loss of a husband who cheated on her, cool and collected at times and at others almost hysterical certain facts long known but never pondered come forward. She held her husbands blasted apart head in her lap all the way to the hospital. What the hell does that do to someone? Less than a week later she marched through Washington with world leaders despite all kinds of security concerns that as assassin could target them again. She took her kids to the coffin and she trained her son to salute it with the whole world watching. Why was ensuring President Kennedy’s legacy so important in helping her grief for an imperfect man that she loved? She showed great foresight in the power of media to create myth but does that make these truths less true? President Kennedy was a war hero, a loving father and husband, a social progressive political leader and the leader of the free world during the Cuban Missile crisis. President Kennedy also oversaw The Bay of Pigs fiasco and fucked around, does that make him any less that first President? Maybe we just need our myths and certainly Mrs Kennedy needed us to believe in one. Does that make it any less real? Definition 1. A traditional story, especially one concerning the early history of a people or explaining some natural or social phenomenon, and typically involving supernatural beings or events. Definition 2. A widely held but false belief or idea. Jackie the movie is about one myth that was both. It will be interesting to see where Portman goes from here. You couldn’t get a hotter actress in 2010 on the cusp of 30 and becoming a first time Mum with an Oscar winning performance. I knew how cruel Hollywood can to women who age though and in the past five years none of her projects have showed off her talent the same way Leon, Closer had done. Plus she wasn’t lighting up the box office either besides her return in the Thor sequel. This should remind Hollywood of just what a talent she is. I know it’s lighting up the box office but it’s an award winner and I look forward to her doing similar work in the future. Again? Will Big Al Pacino be in it or Emma Thompson? Fascinating review. I want to see this for Natalie Portman. She’s a marvellous actress. If you want someone to project emotion, she’s your girl! I’ve yet to see this, but now, after reading your review, Lloyd, it’s a must. Well done, my friend. Well that’s very kind of you mate, like I said I don’t think its for everyone and at times it can be slow and self indulgent but I do think its first rate film making. Actually I’ve just seen The Siege of Jadotville and I think you’ll dig it. I’m looking forward to writing a review, have you? No, I haven’t, but look forward to reading yours, Lloyd. Love the historical perspective given to an action that has fallen in-between the cracks of time. Yeah I couldn’t believe the lack of recognition. Just sent a reply, but it didn’t appear. If it doesn’t show up, I will type it all out again! That’s happened to me a few times too. Very frustrating, this comment appeared so look forward to hearing your thoughts. I will give you a short version. Love Portman, but didn’t like Jackie Onassis much. Don’t really care about how she felt, to be honest. Might be worth watching for Portman, but not really one for me. It will have to wait for a TV showing, if I live long enough. Great review; I found this one too hard to review, so I just didn’t. I definitely liked what I saw; it got a little made-for-TV at some points, but was overall a good movie. Portman is the MVP in this role, and I honestly think she deserves the Oscar…what about you? So many great female performances this year its hard to decide. I think I might be a sucker for Viola Davis for one scene in Fences but I’d happy if Portman won. While I think Natalie was key to the power of the movie I actually feel all facets of production were really well done. Do you think Jackie dragged at times? Jackie totally dragged and almost felt Lifetime at points, but Portman was solid. Yeah I think that’s going to be the case for a lot of people. I suppose anyone alive at the time would remember these events. 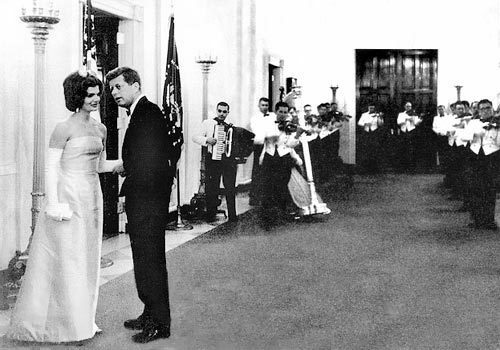 The Kennedy’s had created a false facade and I guess that was what took them down in the end, but Jackie always remained Jackie. They specialised in imagery that’s for sure. A war veteran with a bad back becomes a cool young guy just lazing around yacht looking hip in his sunnies. What that has to do with his assassination I’m not sure since we have so many unanswered questions about it. It was too big for the mob or Castro to pull off alone but then that raises unsettling questions. But that’s another film to review. 🙂 I suspect for a film that re-evaluate how the Kennedy legacy was shaped and reveals some of the flaws and contradictions of them it may hold more interest for those who remember them fondly of which I include myself. Her performance is phenomenal, but I do wish the movie as a whole had gotten more attention. I love the historical accuracy while actually showing the flip side of the story. That might be the problem Jay, I think the teaser trailer which I attached to this review is one of the best of last year. Sadly though I think everybody looked at it and went I know that story which is a shame but hopefully it’s turned a profit and will encourage similar ambitious experimental character pieces to be made. Have you got a favourite for Best Actress?